Take flight with a dark, dark fairy tale, go time travelling with a girl and her dog, and discover what the Ancient Greeks liked to eat in a super selection of January children’s books. And just occasionally that flight reaches such quietly spectacular heights that readers are left dizzied, disorientated and gasping for breath. With an education in cinematography and experience of working in comedy TV production in London, 27-year-old Halpin knows how to weave a thrilling story, and this page-turning adventure is pitched perfectly at middle grade readers who revel in fairy tales with a dark, dark soul but a warm and beating heart. Set in a sleepy, creepy town call Suds, the action is awash in danger, menace, mystery and mythology, but is still cleverly grounded in moments of heartbreaking reality and down-to-earth humour. When Poppy’s mum is killed in an accident and her dad decides that cycling in Canada will ease his grief, she is dispatched by train from London to stay with her eccentric old Gran at her home in the northern town of Suds. But even the journey there doesn’t seem normal… and when a bizarrely dressed woman leaves a purse containing a silk-clad book on a nearby seat, Poppy snatches it up and determines to find its unusual owner. Poppy has only ever visited Suds once before and she soon discovers that the sleepy town is not at all what she expected. It’s a place, she learns, where stories fill the air of local children turning grey and then, ‘one by one, like the birds of summer,’ disappearing without a trace. Meanwhile, Gran has laid own her four important but very strange house rules… all washing must be done during the day, all sugar must be kept under lock and key, windows must be locked shut at night and window sills must never, ever be dusted. Poppy, a fan of Agatha Christie, and her new friend, Erasmus Tall, the boy with white hair, powerful green eyes and the detection skills of Sherlock Holmes, are certain that something peculiar is going on in Suds and are determined to unravel its secrets. But they know that the answers might lie in the old mills in Suds’ dark and twisting woods. Neglected, ruined and overgrown, they are said by many in the town to be haunted. Poppy’s sense of unease is growing stronger every day… can she and Erasmus summon up the courage to creep inside the woods and solve this increasingly perilous mystery? This is a thrilling, atmospheric and classy tale that succeeds not just in its captivating blend of folklore, fantasy and gritty reality but also in its outstanding cast of characters, each exquisitely fleshed out and each honed to individual perfection, whether that is straight-talking Gran, peerless Poppy or eccentric super-sleuth Erasmus. The drama-filled years of the Second World War spring to vivid life in a haunting and evocative story from one of 2017’s most critically acclaimed debut children’s authors. Lucy Strange, whose novel The Secret of Nightingale Wood was selected as one of Amazon.com’s Best Middle Grade Books of the year, returns with an adventure woven around a girl struggling with the fall-out from a conflict which has put her once happy family firmly in the local spotlight. It’s 1939 and England is at war. Growing up in a lighthouse on the South East coast, the world of Petra (Pet) Zimmermann Smith has, until now, been one of storms, secret tunnels and thrilling stories about sea monsters, like the fantastical legend of the Wyrm and the Stones. By the autumn of 1940, it is clear that the Germans are getting closer and closer to England, the clifftops are a terrifying real-life battleground, and Petra’s half- German, half-English family is being torn apart. With her beloved mother officially labelled an ‘enemy alien,’ her older sister Magda acting suspiciously, and events spiralling out of her control, Pet feels small, afraid and unnoticed. She is a girl who must suffer the prejudices of others, who freezes with fear at the enemy planes ripping through the skies overhead… and a girl who is somehow destined to become part of the strange and ancient legend of the Daughters of Stone. Strange tackles sensitive issues with honesty, compassion and insight as the increasingly lonely Pet watches her old and contented life fast disappearing under the weight of suspicion, accusation and discord. Pet’s personal battle to summon up the courage to fight back against the bullies and to discover the truth about her family is beautifully offset by the legend of the Daughters of the Stone which brings much-needed light into the darkest of her days. With a compelling adventure at its warm heart, this is a thought-provoking and essentially compassionate story that speaks loudly of the damage inflicted by war not just on a grand scale but in the smallest corners of domestic life. Former magazine journalist and television producer Ross Welford is back to bewitch, bewilder and astound his young readers with an enchanting adventure featuring time-travel, thrills galore… and an adorable dog. Welford is already the bestselling and Costa-shortlisted author of the sci-fi-inspired middle grade novels, Time Travelling with a Hamster, What Not To Do If You Turn Invisible and The 1,000-year-old Boy, and this new page-turner offers the same winning blend of adventure, fun, laughter and tears. When eleven-year-old Georgie befriends eccentric retired scientist Dr Pretorius, she becomes the test subject for a thrilling new experiment… a virtual-reality 3D version of the future. But then a deadly disease threatens the life of every dog in the country and Georgie’s beloved dog, Mr Mash, gets sick. And that’s only the start of her troubles. Soon, Georgie and Mr Mash must embark on a desperate, seemingly mission impossible… to save every dog on earth, and maybe even all of humanity, without actually leaving the room! Expect extraordinary science, big ideas, a cast of (mostly!) 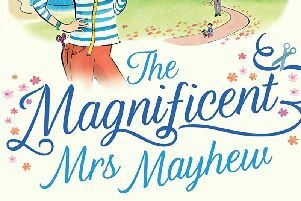 lovable characters, lots of laughs and a few poignant moments as Georgie and Mr Mash embark on a remarkable time-travelling quest with the stakes so high that the outcome could be out of this world. Take an exciting trip back in time to learn about the glorious Ancient Greeks and the fearsome pirates who once roamed the seas with two fabulously illustrated, fun and informative books from talented Welsh author and illustrator James Davies. Meet the Pirates and Meet the Ancient Greeks are the two new books in a cleverly conceived series that began with entertaining studies of the Ancient Egyptians and Ancient Rome. Designed as short, eye-catching introductions to history for younger readers, these busy but fun-filled and easy-to-read explorations of history make learning facts seem like an extension of playtime. When it comes to history, there is so much to digest that it is difficult to know where to begin but Davies fills the pages with facts and figures that will amaze and interest the youngest children. There are hours of discovery in the pages… get to know the basics on Ancient Greece from religious ceremonies to day to day life, and discover the fascinating facts on pirates from famous looters to scurvy and hygiene through fabulous illustrations and a light-hearted text that is reminiscent of the bestselling Horrible Histories series. Learn about the different types of pirates, the roles and features of a crew on a pirate ship, meet some of the most feared pirates that sailed the oceans, and discover the nightmare concept of Davy Jones’ Locker, the deep sea graveyard of dead pirates. And Ancient Greeks examines the lives the Hellenes (people known in modern times as the Greeks). From the fantastical myths of the heroes and monsters, and the notorious Greek gods, this journey into the ancient past explores all the well-loved aspects of ancient Greek history as well as revealing how the people ate, exercised and fought. Davies’ stunning artwork and playful infographics in a limited palette provide a fresh, non-fiction approach that is sure to captivate young readers. Combined with a vibrant, snappy text, these brilliant books blow away the cobwebs from centuries of history! Enjoy classic fairy tales as you have never before seen them! Snow White and the Seven Dwarfs, Sleeping Beauty and The Little Mermaid are part of Disney Animated Classics, a sparkling new series from Studio Press, each book presenting an enchanting retelling of Walt Disney’s eternally popular films as seen through the animator’s eye. These beautiful hardback books with their premium cloth binding, ribbon marker to match the cover, gold foil stamping and illustrated endpapers, make the perfect gifts for all those who have been spellbound by the magic of Walt Disney’s famous animated classic films. Family favourites for over eighty years, Snow White and the Seven Dwarfs, Sleeping Beauty and The Little Mermaid are some of the best-loved films of all time. Relive the star-dusted stories through these beautiful retellings of the iconic films by Lily Murray, featured alongside paintings, sketches and concept art from the original Disney Studio artists. And when the story is finished, youngsters can turn to the back of the book to learn more about the artists who worked on these memorable animated films. With forewords by Eric Goldberg, a supervising animator and director at the Walt Disney Animation Studios, Disney filmmaker Mike Gabriel, and Brittney Lee from Walt Disney Animated Studios, these sumptuous books, full of atmospheric retellings and fascinating illustrations, are perfect for both Disney fans and young collectors. This beautiful peek-through book takes an enchanting journey back through time to discover a world where the land, skies and seas were ruled by mighty dinosaurs. Enjoy illustrator Thomas Hegbrook’s amazing assortment of dinosaurs teamed with intriguing peep-through holes which add wonderful extra layers and eye-catching appeal to landscapes filled with life, vibrancy and colour. Children will love trying to recognise the different species of these amazing creatures as they follow the story of their evolution from the depths of the sea, into the skies and then onward over land, rocks and sand to the giant dinosaurs that walked the Earth. Patricia Hegarty’s gentle, evocative and lyrical rhyming text provides atmosphere and fascinating facts to this incredible and revealing illustrated journey through the prehistoric world. Both a soaraway poetic experience and an educational adventure through a timeline of the dinosaur species, The Song of the Dinosaurs is a rich reading and sharing experience for home, nurseries and schools.